A survey of more than 600 scholars from 22 disciplines, ranging from psychology and economics through to gender studies, sociology and the humanities, finds that there remain two distinct cultures in the academe, at least regarding views on the principal causes of human behaviour and human culture. One group, made up of psychologists, economists, philosophers and political scientists believes more strongly in the genetic influences on behaviour, beliefs and culture. The other group, consisting sociologists, non-evolutionary anthropologists, women’s and gender studies scholars and all humanities scholars (except philosophy), believes in the primacy of environmental influences. What’s more, those scholars favouring environmental accounts also tend to be sceptical of the scientific method. “Human behaviour is not subject to immutable laws, and, therefore, can’t be studied scientifically,” said a religious studies scholar. “Scientific knowledge has something to tell us about material artefacts and their production, but ‘human nature’, ‘human experience’ and ‘human behaviour’ are not empirically stable,” said a literary studies scholar. 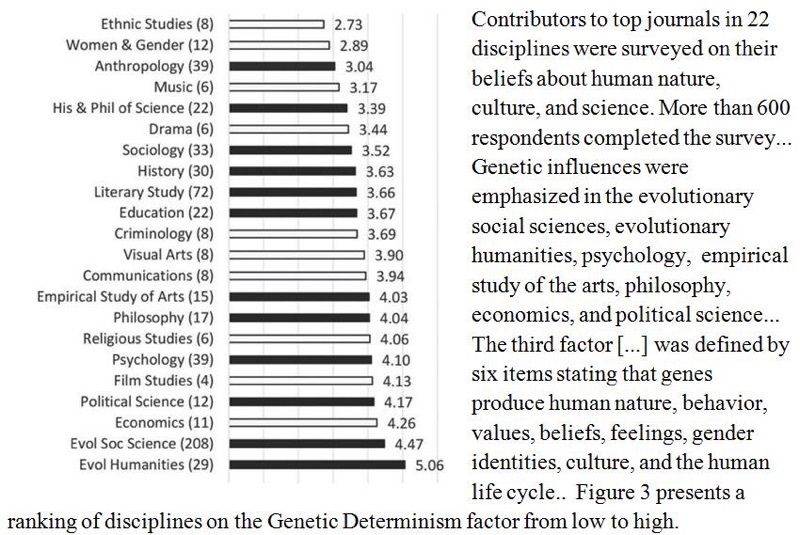 In contrast, scholars favouring genetic and evolutionary accounts of behaviour expressed faith in science. A while back I was having a conversation with someone who professed to work with undead spirits and the supernatural. As you know, I don't think that appealing to the supernatural is a good explanation for whatever phenomenon we are attempting to describe. As a matter of fact, from a Bayesian point of view, it's much more likely that a naturalistic explanation that has an intrinsically higher prior probability, that can also explain the phenomena, is the better candidate for explanation. I didn't actually get into a full-blown arguement with this person, I just sort of asked some Socratic-dialog like questions to see if she could quell my skepticism. One of the things I asked was how it was that these ghosts and other supernatural beings intake useful energy and release non-useful energy. She didn't seem to understand what I was asking, so I used a car and the human body as an example. Gasoline/food goes in, heat/methane/CO2 goes out. She simply asserted that supernatural beings consume "electromagnetic energy". This was an obvious attempt at using the literary genre of science to make it sound like she was doing actual science, but I obviously saw through that (i.e. I asked "what do you mean by that?" but she couldn't answer, since there are multiple types of E-M radiation). What she then said was that science was wrong in the past, so it will probably be wrong in the future, and used the shift from a geocentric view of the universe to a heliocentric view of the universe as an example. "Laws of physics" she said, "were completely overwritten in the past, so they will be overwritten in the future". Therefore, she will be vindicated in some future physics that will show that her beliefs were always compatible with science. I actually do think that will happen, but not from the physical sciences. The part of science that will shed light on why she believes what she does will probably come up in neurology and psychology, or other areas of cognitive science, not from the physical sciences. Well, that part is already available, it's just that this scientific knowledge hasn't become common knowledge. Yet. Anyway, if I had been thinking faster, I would have corrected her misrepresentation of the progression of science with the analogy I'm about to write. But all I could say was that previous theories were never really overturned, it was just that newer theories were less wrong than previous ones. So yeah, here is the analogy: Imagine you live in an apartment building Harlem and you attempt to draw a map of all of New York City. Let's say you've never been outside of the block that your apartment building is on. This map might be accurate for say, your immediate neighborhood, but it won't be accurate for all of NYC. Let's say, then, that you decide to walk a 10 block radius around your apartment. Again, this map might be more accurate than your previous map; it will be accurate for the 10 block radius around your apartment and a bit beyond, but it still won't be accurate for all of NYC. Next, let's say that eventually, you decide to walk all around Manhattan island and then attempt another map of NYC. Again, this map will be more accurate than your previous maps, but it won't be accurate for the entirety of NYC. Each update to this map, as you explore more and more of NYC with your own eyes, will be more accurate than your previous maps until you've been to all of NYC. Moreover, you will be able to see the logical evolution of these maps and why the previous maps got what they got right and got what they got wrong. No successive map will be completely unrelated to a previous map. Furthermore, each map follows a Bayesian updating scheme, where new information is included into previous information. The scientific model of knowledge progression that the psi-ist person was promulgating was a wholly unBaeysian progression of science. As Isaac Azimov wrote, they think that one day science will say that the Earth is a sphere, and then the next day science will say that the Earth is a rectangle, the next day a trapezoid, the next day a donut, etc. None of those models has any logical progression between them, and none of those models follows any sort of Bayesian updating. They are just random. Αnd I think I'll apply this to the current tide rising in the Historical/Mythical Jesus debate. To pick the most obvious example, the current JM hypothesis posits that Paul and other early epistle writers would have quoted a teaching of Jesus if they viewed Jesus as a preacher instead of a mythical/legendary/cosmological savior figure. Since they don't do this, then it fits their hypothesis. On the other hand, the HJ hypothesis posited by most scholars is a sort of floating ad-hoc explanation for this. That is, if the early epistle writers did quote a teaching of Jesus, this would be evidence for their hypothesis (a preaching Jesus). But, if the early epistle writers did not quote a teaching of Jesus… well, this is still evidence for their hypothesis (a preaching Jesus). This is why Bayes theorem is useful. It points out glaring ad hoc hypotheses like these. It's a heads I win, tails you lose set up by scholars. Let H be the hypothesis that a preaching Jesus existed. E is early epistle writers quoting from the preaching Jesus. Let's say that the probability of the preaching-historical or mythical Jesus is equally 50% (i.e. P(H) = 50%) just for pedagogical value. In the mythical Jesus model, P(H|E) > P(H); the probability of Jesus existing given the evidence of epistle writers quoting him is higher than the bare bones probability of Jesus existing. That is, the probability of Jesus existing is nudged higher than 50% if a letter writer like Paul quotes from Jesus. On the flip side, the P(H|~E) < P(H); the probability of Jesus existing given the lack of evidence of epistle writers quoting him is lower than the bare bones probability of Jesus existing. That is, the probability of Jesus existing is nudged lower than 50% if a letter writer like Paul does not quote from Jesus. In the historical Jesus model, both P(H | E) AND the P(H | ~E) are the same. When this happens, it basically means that the probability stays at 50%. This violates the probability calculus inherent in Bayes Theorem. Since Bayes is formally/logically valid, this means that the set up that mainstream scholars have erected is logically invalid. E and ~E can't both be evidence for the same thing. The only time that happens is when you're dealing with ad hoc hypotheses: “A hypothesis that forbids nothing, permits everything, and thereby fails to constrain anticipation. Your strength as a rationalist is your ability to be more confused by fiction than by reality. If you are equally good at explaining any outcome (my emphasis), you have zero knowledge“. The likelihood ratio for X, p(X|A)/p(X|~A), determines how much observing X slides the probability for A; the likelihood ratio is what says how strong X is as evidence. Well, in your theory A, you can predict X with probability 1, if you like; but you can't control the denominator of the likelihood ratio, p(X|~A) – there will always be some alternative theories that also predict X, and while we go with the simplest theory that fits the current evidence, you may someday encounter some evidence that an alternative theory predicts but your theory does not. That's the hidden gotcha that toppled Newton's theory of gravity. So there's a limit on how much mileage you can get from successful predictions; there's a limit on how high the likelihood ratio goes for confirmatory evidence. On the other hand, if you encounter some piece of evidence Y that is definitely not predicted by your theory, this is enormously strong evidence against your theory. If p(Y|A) is infinitesimal, then the likelihood ratio will also be infinitesimal. For example, if p(Y|A) is 0.0001%, and p(Y|~A) is 1%, then the likelihood ratio p(Y|A)/p(Y|~A) will be 1:10000. -40 decibels of evidence! Or flipping the likelihood ratio, if p(Y|A) is very small, then p(Y|~A)/p(Y|A) will be very large, meaning that observing Y greatly favors ~A over A. Falsification is much stronger than confirmation. This is a consequence of the earlier point that very strong evidence is not the product of a very high probability that A leads to X, but the product of a very low probability that not-A could have led to X. This is the precise Bayesian rule that underlies the heuristic value of Popper's falsificationism. Now, what if you posit a Jesus that wasn't a preacher? This would also make sense of the evidence; P(non-preaching Jesus | ~E) > P (non-preaching Jesus). That is, we would expect the early epistle writers to not quote Jesus because they didn't view him as a preacher. Accurate geographical details = Evidence for historicity. Inaccurate historical details = no problem for historicity/no effect on the historicist model. You can see where this is going. Accurate and absence should be on either side of the probability formula. This time E would be accurate historical details; in the HJ hypothesis P(H | E) is still equivalent to P(H | ~E). The problem here is with constraints. I hate to say it, but most scholars work under the assumption of a wandering, preaching Jesus without any constraints on what a wandering, preaching Jesus would entail. So they look at all of the evidence through the lens of a wandering, preaching Jesus. As the quote I posted above says, we should be looking for evidence that disconfirms our pet theories and not look for confirmation of our theories. Because the disconfirmation, as the blog of awesome that I quote from is named, helps us to become less wrong. And becoming less wrong is a lot more powerful than being “right”; implicit in the phrase “less wrong” is admitting to our own fallibility and trying to mitigate it. On the other hand, “confirmation” of our theories only feeds our ego (because it's the default human cognitive bias). On a higher level, this lack of constraints/making beliefs pay rent seems to also apply to the Problem of Evil. We have this world that seems to be indifferent to our suffering. It would make sense that the ultimate reality (god, the matrix, etc.) actually is indifferent to our suffering. But theists posit that their god loves us and has some sort of plan for all of it or is so in love with Free Will that he will not abrogate it to ease our suffering. The problem is that this god would also explain a world that is 100% free of all suffering (heaven), and this god could also be used to explain a world that is 0% free of suffering… and every single percentage point in between the two extremes. While an indifferent god or no god at all would not explain either of those last two options. Which worldview is operating on constraints, and which one is not? Which one is making their belief(s) pay rent and which one is letting their belief(s) squat? A theory/worldview that can be used to explain every single possible outcome is really no explanation at all.